SSC JE Admit Card 2016, Download SSC Jr Engineer 2016 Admit Card Paper 2 Call letter Hall ticket All Regions - Staff Selection Commission (SSC) is going to conduct Junior Engineer (JE) 2016 computer based exam on 20 to 23 December 2016. 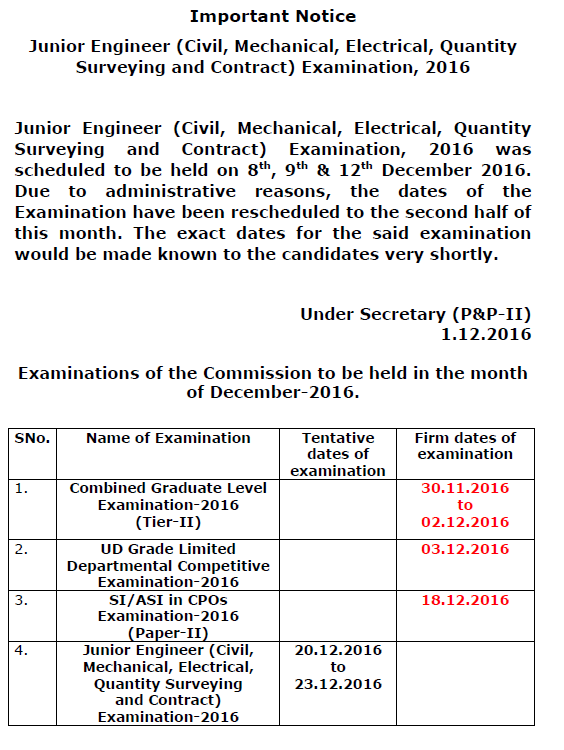 SSC will organize a written examination for Junior Engineer (Civil & Electrical & Mechanical). The test will be held at various centres located all over the country. Many number of diploma & Engineering candidates appear for it. The selection is to be done on the basis of performance in written exam only (revised). You can download their SSC JE Exam Admit Card 2016 from the direct links given below. Through the admit cards, candidates can know their exam venue, reporting time, ticket no., roll number etc. The test is to be organized on 20-23 Dec 2016 and this time there is no interview for these posts. 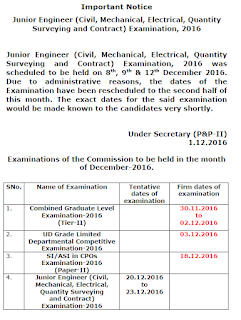 SSC had again revised the exam date of SSC JE 2016 exam. Now the test will be held from 20 to 23 December 2016. SSC ER had released know roll no. & application status link. Also the list of accepted / rejected candidates is available for Western region. You can know which states comes under which region from below table as well as download the admit cards. The candidates need to possess Degree or Diploma in Civil or Electrical or Mechanical Engineering from an institution recognized by Govt. of India or equivalent qualification in order to apply for these posts. I - JE(Quality Surveying and Contract), Military Engineering Service. Candidates can download their SSC JE Admit card 2016 for Paper 2 Examination by clicking on download link given on the side of region and state in the table below. The download links for admit card of Junior Engineer 2016 examination are provided here. The examination will consist of online written test only (Paper-I and Paper-II). There will be no interview this time as per the revised selection process. Candidates are allowed to bring their own Slide–Rule, Calculator, Logarithm Tables and Steam Table for Paper-II only. They are not allowed to use such aids for Paper-I. Candidates can download their SSC JE Hall ticket / admit card from the direct links given above after release.